The Tactical Mobile Robot program, in the DARPA Advanced Technology Office, has enlisted JPL 's Machine Vision Group in leading the design and implementation of its perception urban robot. This urban robot (Urbie) is a joint effort of JPL , iRobot Corporation, the Robotics Institute of Carnegie Mellon University, the California Institute of Technology , and the University of Southern California Robotics Research Laboratory. Urbie's initial purpose is mobile military reconnaissance in city terrain but many of its features will also make it useful to police, emergency, and rescue personnel. The robot is rugged and well-suited for hostile environments and its autonomy lends Urbie to many different applications. 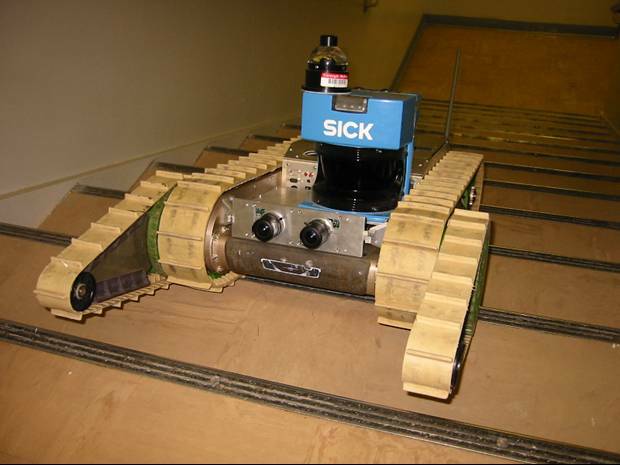 Such robots could investigate urban environments contaminated with radiation, biological warfare, or chemical spills. They could also be used for search and rescue in earthquake-struck buildings and other disaster zones.